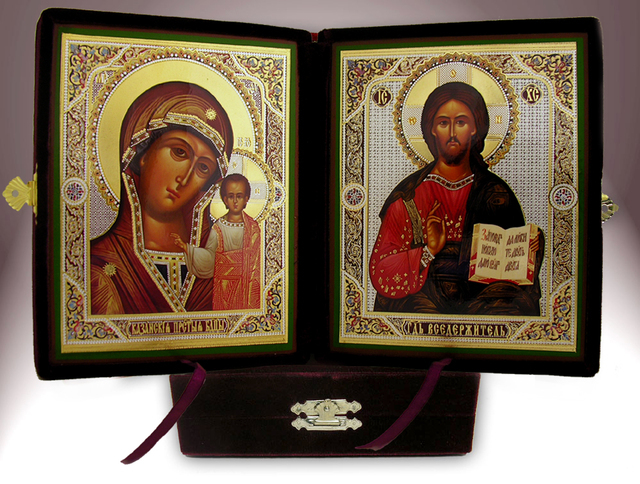 The Diocesan Bookstore, located at the Diocesan Headquarters in Mars, Pennsylvania, offers a wide variety of spiritual books in both English and Serbian as well as icons, vestments and other church needs. 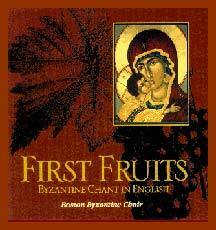 For more information please contact bookstore@easterndiocese.org. Copper top over pressed wood. 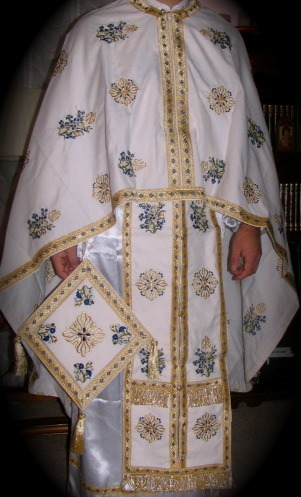 Embroidered Priest's vestment set. 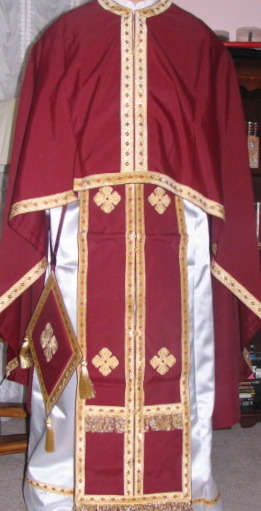 Includes: stihar (sticharion, tunic), epitrahilj (stole), pojas (belt, girdle), narukvice (cuffs), nadbedrenik (sword, genual) i felon (phelonion, chasuble). It comes with the covers for the Holy Gifts. 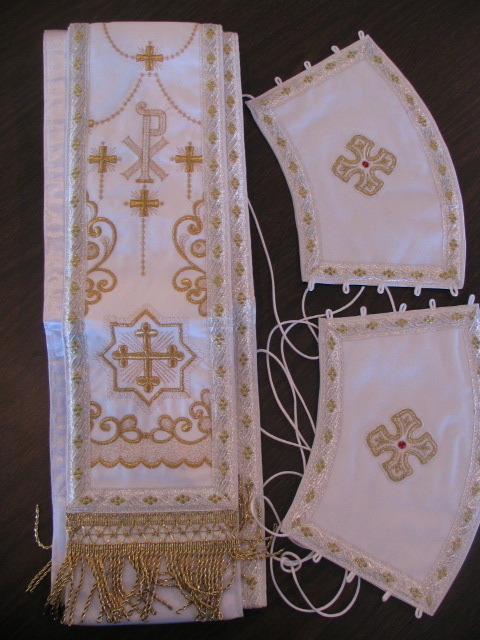 Embroidered clergy vestment set. 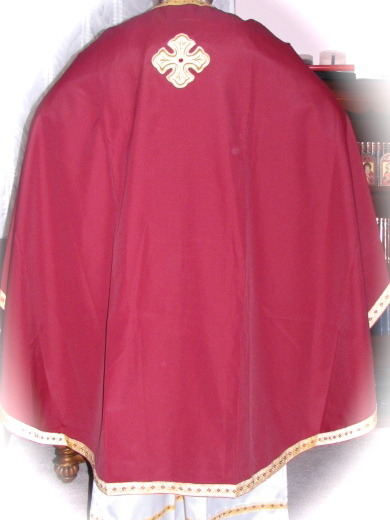 Includes: stihar (sticharion, tunic), epitrahilj (stole), pojas (belt, girdle), narukvice (cuffs), nadbedrenik (sword, genual) i felon (phelonion, chasuble). It comes with the covers for the Holy Gifts. 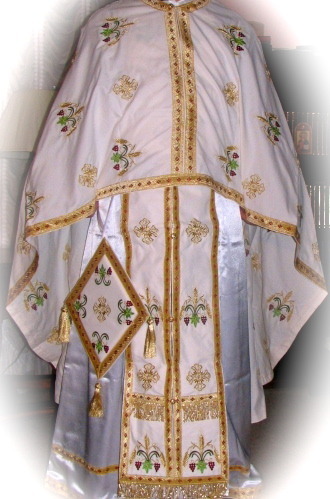 Priest's vestment set. 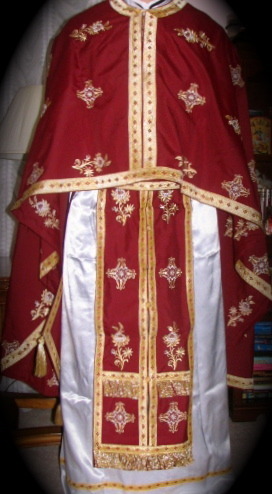 Includes: stihar (sticharion, tunic), epitrahilj (stole), pojas (belt, girdle), narukvice (cuffs), nadbedrenik (sword, genual) i felon (phelonion, chasuble). It comes with the covers for the Holy Gifts. 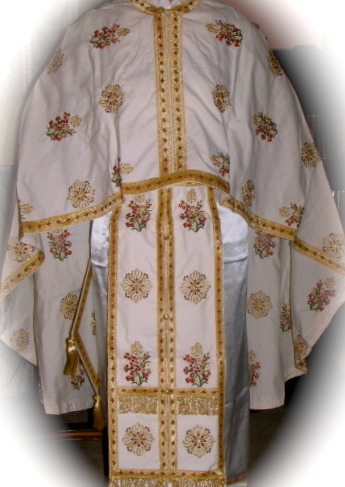 Very rich set of Deacon's vestments. 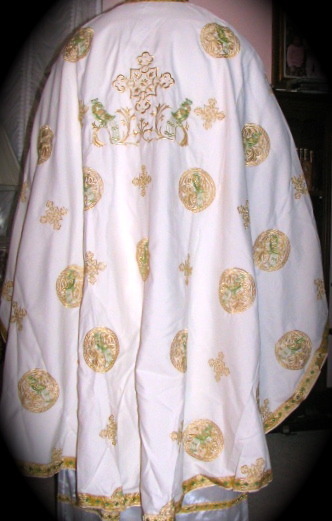 Made of white velvet and very richly embroidered. Includes stihar (sticharion, tunic), narukvice (cuffs) and orar (orarion). Fits 5.8 to 6.2 ft. tall. 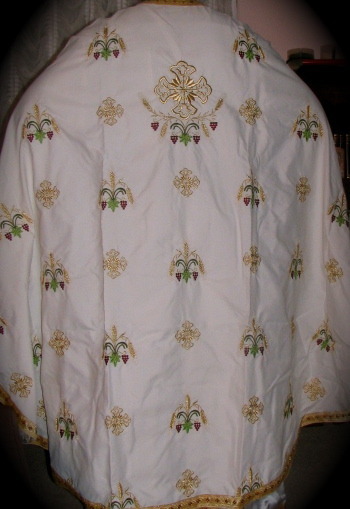 Embroidered Deacon's vestment set. Includes: stihar (sticharion, tunic), narukvice (cuffs), and orar (orarion). Glass icon bottles, also known as a Чутура (Cutura), Плоска (Ploska), or Букуља (Bukulja), with would frame around and copper over the top. 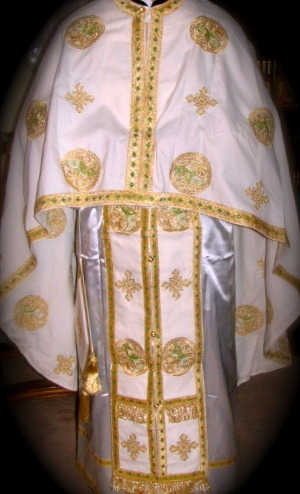 Features an icon of the Saint on one side and Prayer by St. Bishop Nikolai, or Serbian coat of arms on the other side. Comes with colored strap. Holds one litre. 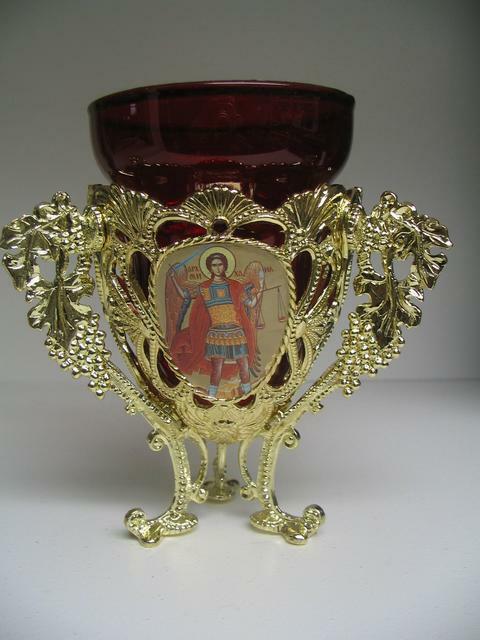 Perfect for celebrating slavas, weddings and baptisms! 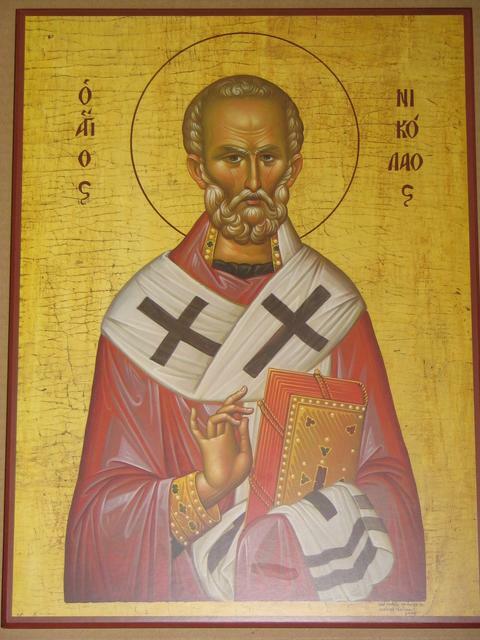 Available with: St. Alimphius the Stylite, St. George, St. Thomas, St. Cosma and Damian, St. Nicholas, St. Petka, St. Luke, St. John, St. Sava, St. Archangel Michael St. Archdeacon Stephen, Most Holy Theotokos and Cica Draza. 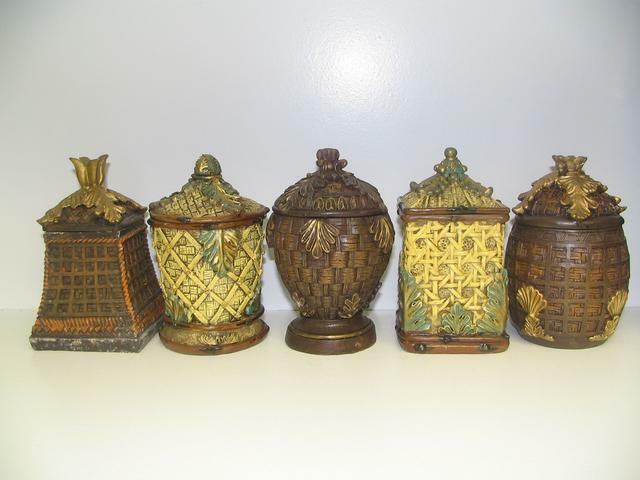 Glass icon bottles, also known as a Чутура (Cutura), Плоска (Ploska), or Букуља (Bukulja), with would frame around and copper over the top. 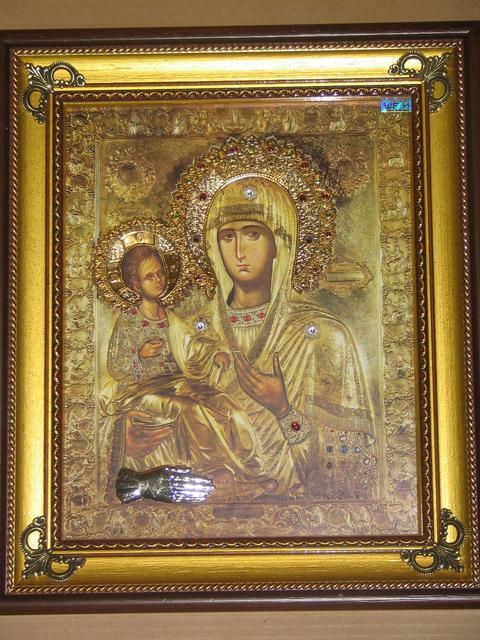 Features an icon of the Saint on one side and Prayer by St. Bishop Nikolai or Serbian coat of arms on the other side. Comes with colored strap. Holds one litre. Perfect for celebrating slavas, weddings and baptisms! 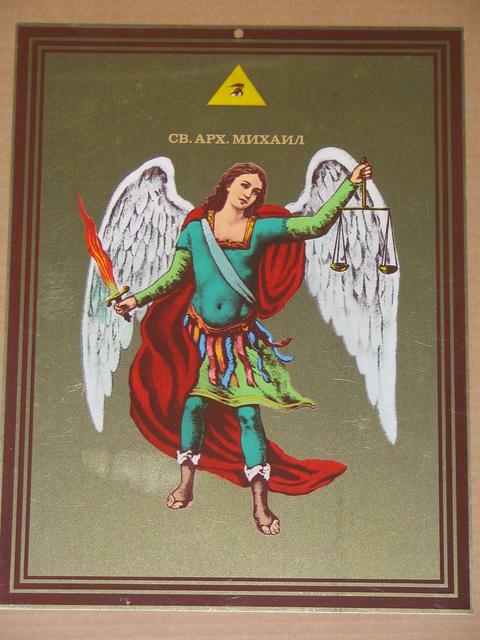 Available with: St. Petka. Only one remaining!!! Stands 8 inches high, with the bottle circumference at 6 1/2". Plastic bottles, with collored shoulder around and an icon on front size. Limited quantity available. 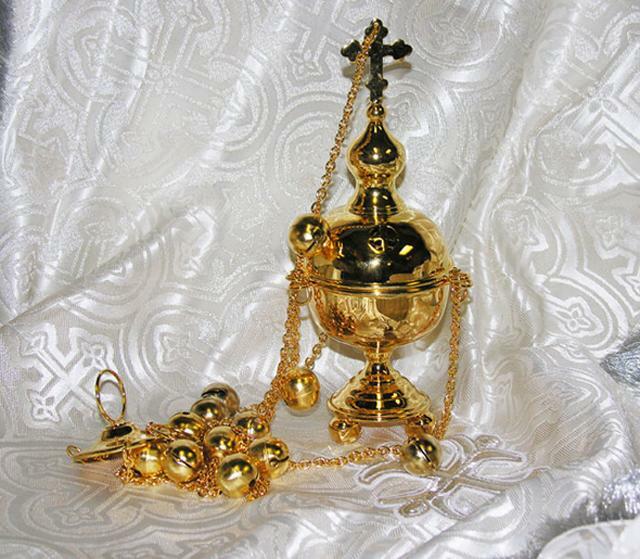 Ideal for the Holy Water. 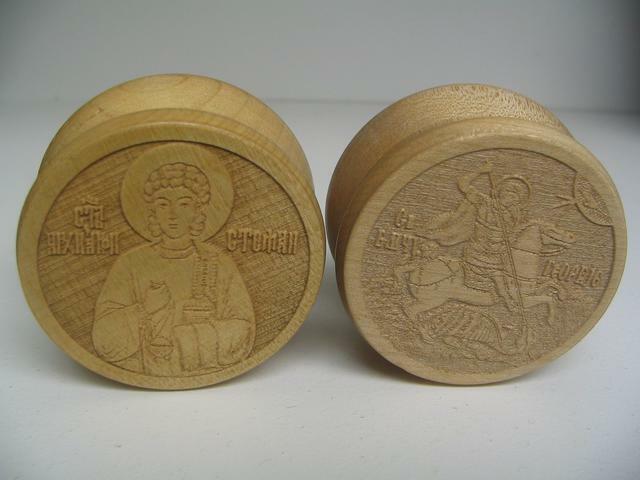 Currently in stock: St. Nicholas, St. George, St. Demetrius, St. Stephen, Most Holy Theotokos, St. 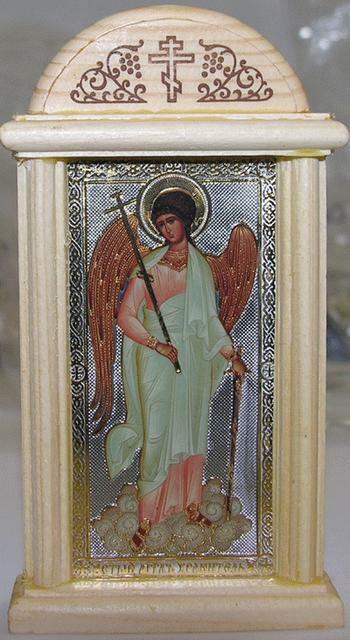 Basil of Ostrog, White Angel, St. Prophet Elijah, St. Archangel Michael and St. Apostle Luke. 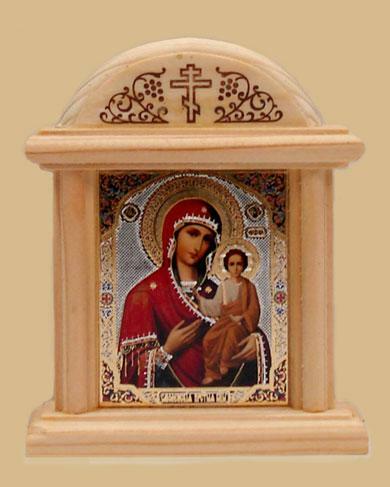 This icon shrine features an icon of the Most Holy Mother of God. Icon could be changed as per request. 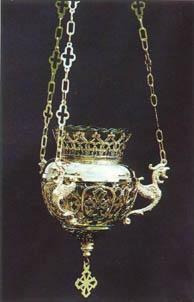 It is made from bronze. Size is: 12 1/2 inches - height, 6inches wide (closed) and 12 inches wide (open). 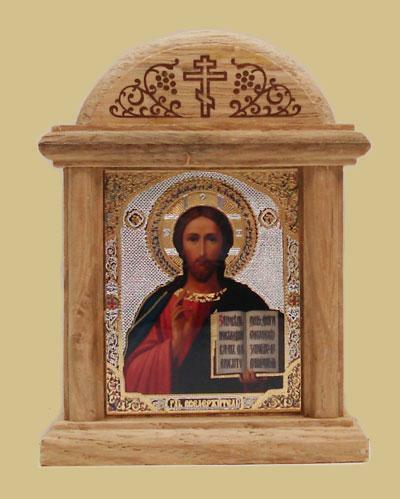 Ideal gift for Churches, or for home prayer corner. 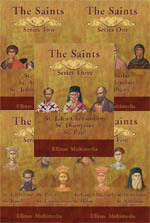 Five series of the lives of Saints that includes total of 17 Saints. 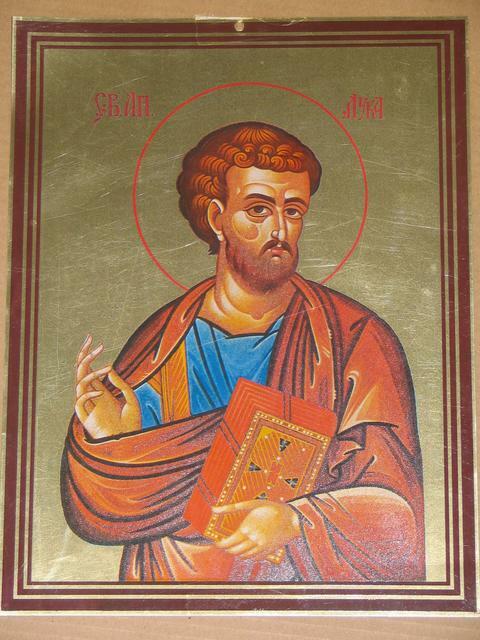 Life of each Saint is disccused in 30 minutes time frame by Orthodox Priests and Iconographers. First three series cover lives of 3 Saints each and last two series lives of 4 Saints each. 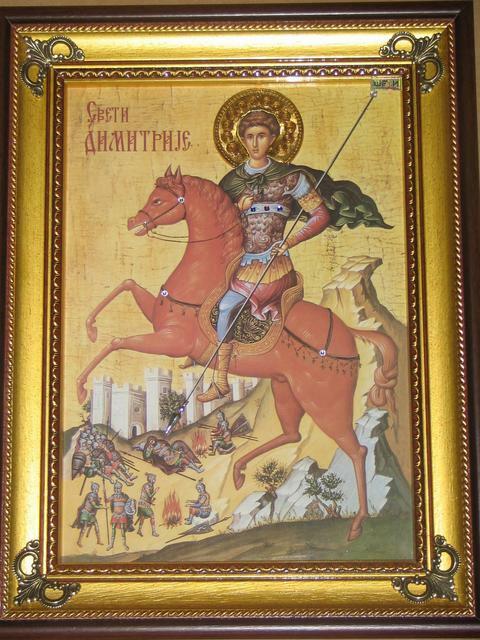 V - St. Archangel Michael, St. Demetrios the Great-Martyr, St. Helen the Empress and St. Nectarios of Egyna. 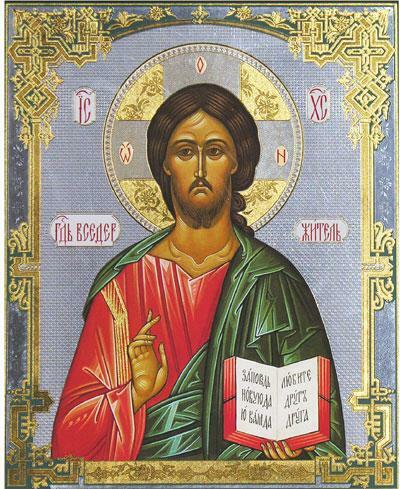 This DVD contains three lectures on Orthodoxy. Each lecture last 30 minutes, which leaves time for the disccusion in one class time frame. Frst two lectures are designed for adults and teenagers. 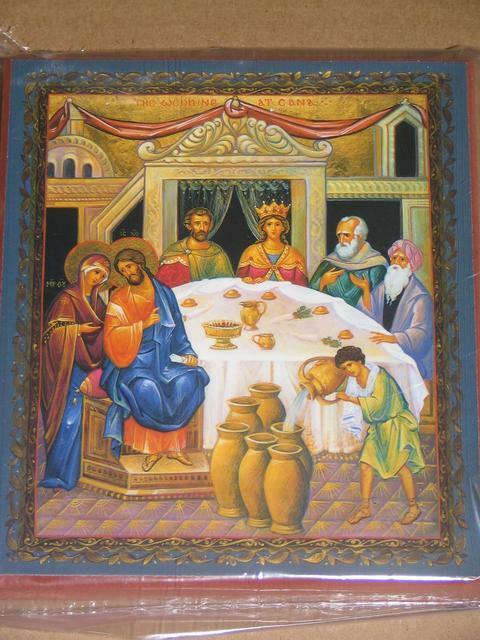 They are excellent tool for those who are thinking about converting to Orthodox Faith as well as for all those who want to learn more about their Orthodox teaching. Third lecture is designed for kids. Lecture III - The ABC's of Orthodoxy (for kids). 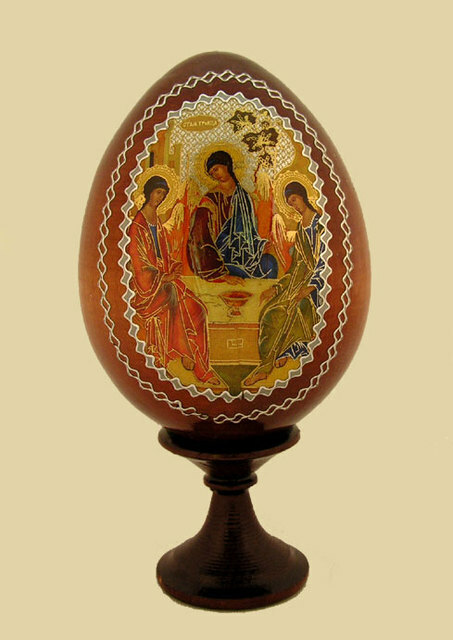 Russian diptych, presented in a velvet box. Makes an excellent wedding gift. 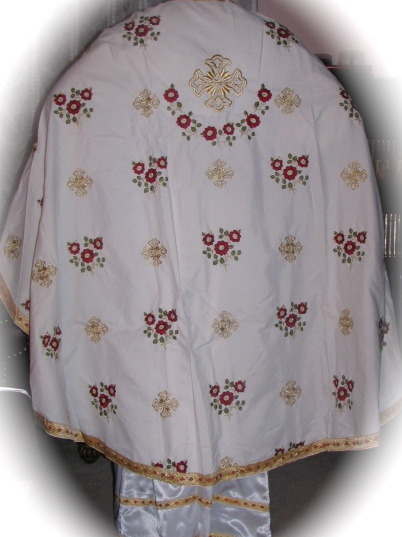 Embroidered wedding and baptismal cloths. 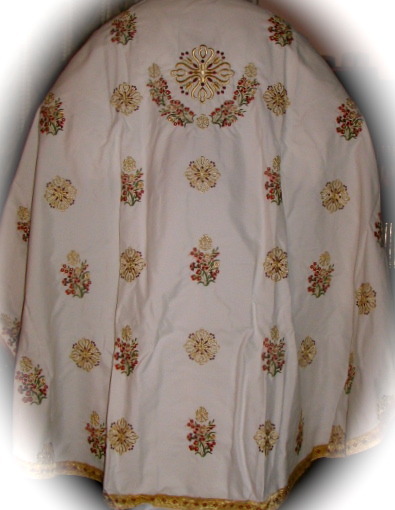 Wedding cloths are used to tie the hands of the bride and the groom during the Holy mistery of Matrimony. 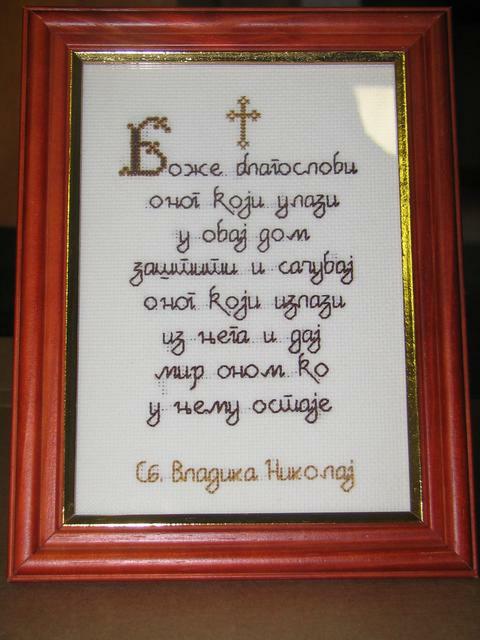 There are several different styles with the inscription "Srecno krstenje" and "Srecno vencanje." 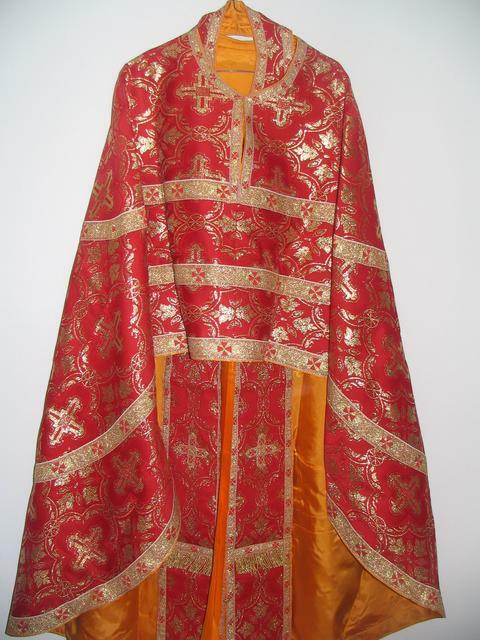 There are also cloths (peskir) with inscription "DEVER" for the wedding. 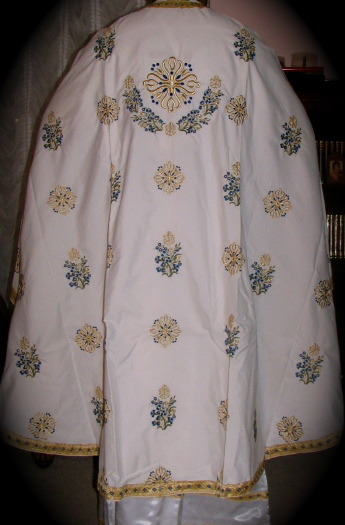 Hand made embroidered Slava cloths are done on white linen, with the embroidery in defferent colors. 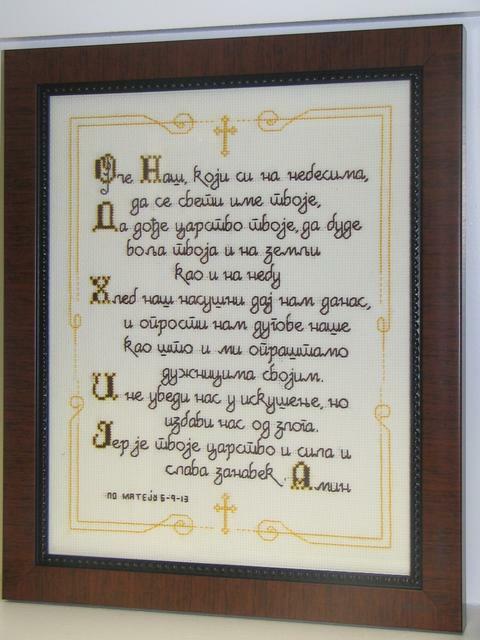 The inscription is done in Serbian (Cyrilic fonts). 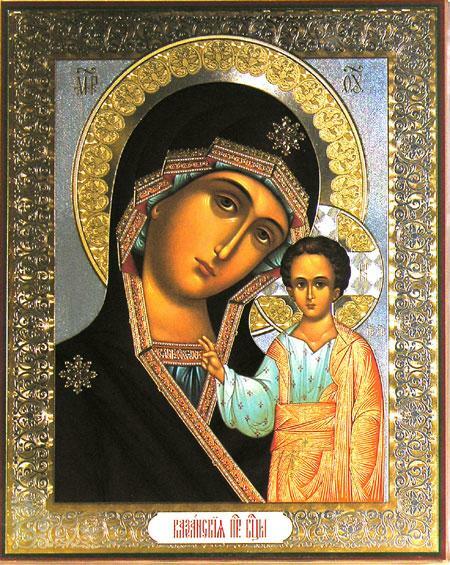 Icon wall calendar - 2010 - NOW AVAILABLE!!! 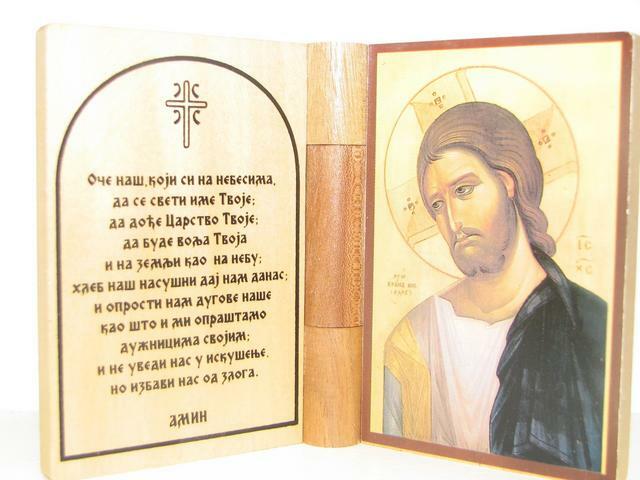 A beautiful calendar with 13 large size icons (cover page and a separate icon for each month). Makes an excellent Christmas gift. Style I - streching bracelet made of 5 icons and multi-color bids. 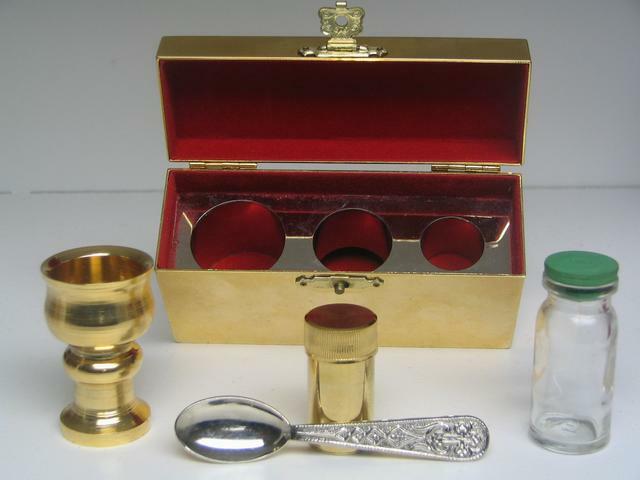 Available in gold, shiny silver and antique silver finishes. 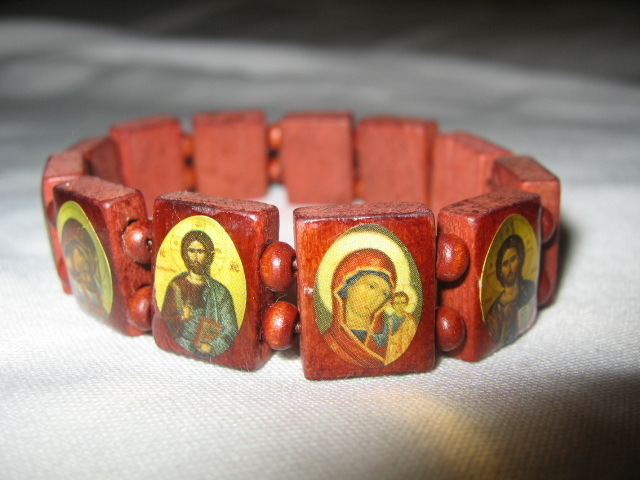 Style II - streching bracelet, made of 12 icons on wood. Style III - Adjustable for sizes from 6 3/4" to 8 1/2". Available in shiny silver and antique silver finishes. Approximate size: 11,5 x 6 inches. 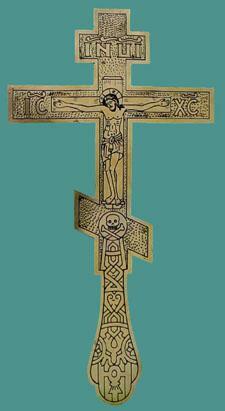 Wall cross with Crusifiction. Wood/metal. Available in gold and silver tone. Wooden or plastic two-sided bread stamp. Has another round stamp with IS HS - NI KA inscription on the back. 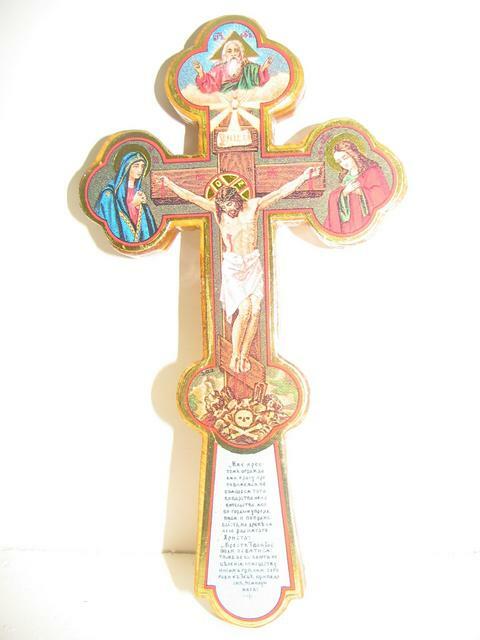 Approximate size: main side - 5,5 inches and back side 3,5 inches in diameter.Wood style also available in smaller size. Soft enamel on metal. 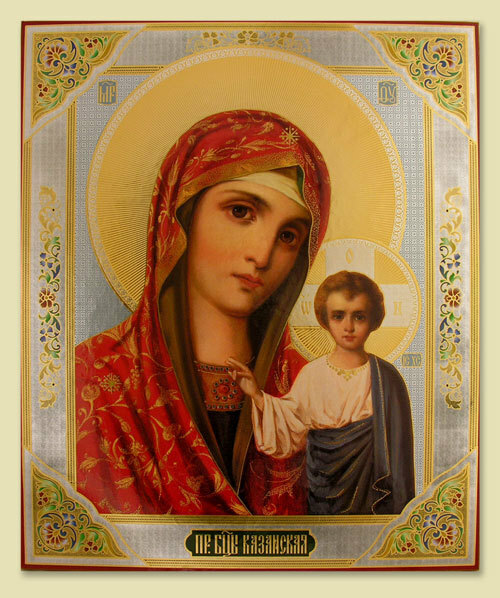 Available: Deisis, Lord Jesus Christ, The Most Holy Mother of God "of Perpetual help", St. George, St. Archangel Michael and St. Nicholas. Metal cross visor clips. 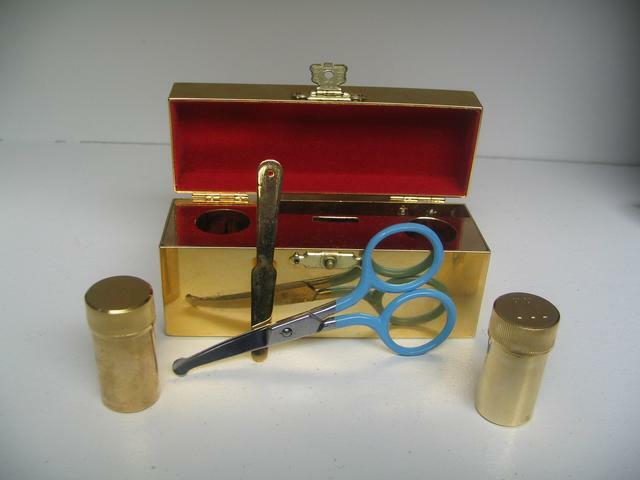 Available: antique gold/antique silver plated metal. Size: 2,5 x 1,5 inches. Comes with 46 inches matching chain. 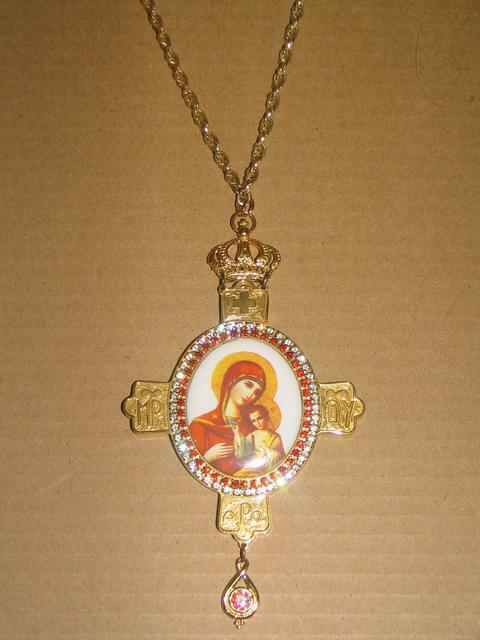 Available in gold or silver color with blue inscription. Size: 4 x 3 inches. Made from microfiber. One size only. For approximately 6 to 6,3 feet tall. 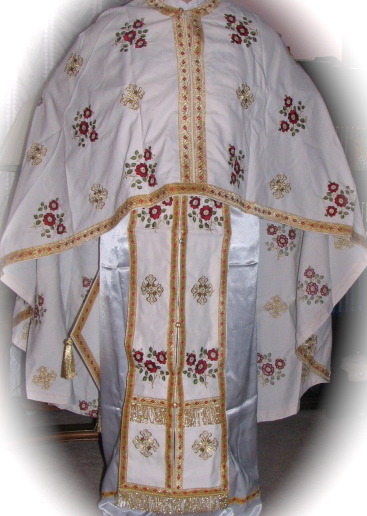 Complete clergy vestment with covers for the Holy Gifts. 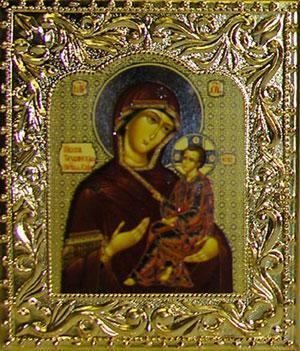 Available with icons of the Lord Jesus Christ, Most Holy Mother of God, St. George, St. Nicholas, Sts. 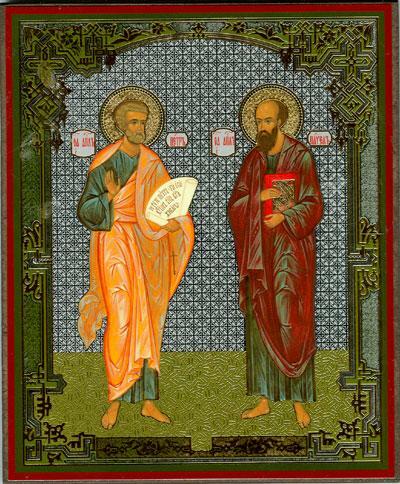 peter and Paul, Sts. 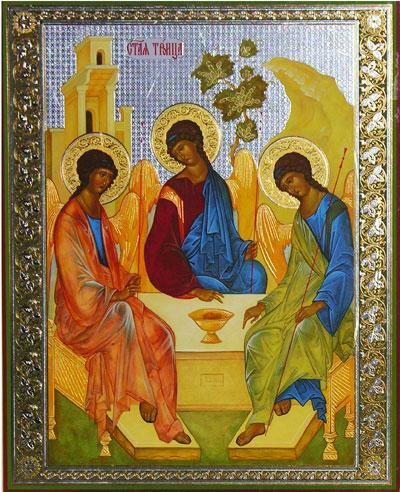 Cosma and Damian, St. Archangel Michael, St. Archdeacon Stephen, St. 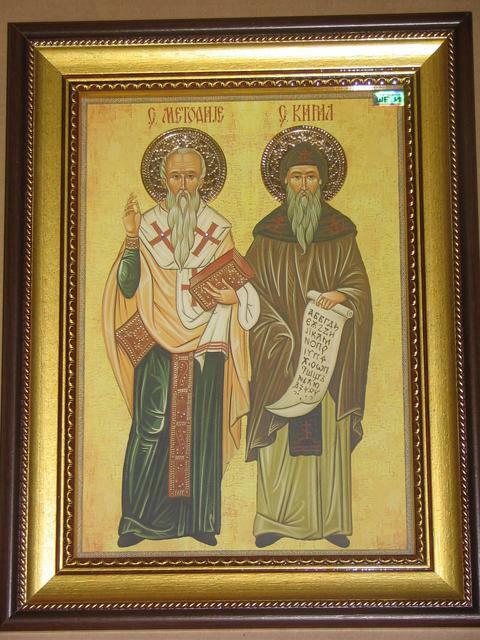 Basil of Ostrog, St. Bishop Nikolai of Zicha, St. John the Baptist, St. Tryphon-Martyr, St. Apostle Thomas, St. Apostle Luke, St. Stevan of Dechani, St. Alimpius the Stylite, St. Demetrios, St. Petka, St. Apostle Mark and Sts. Sergius and Bacchus - Martyrs. Comes with a box of the wicks and a floating device. 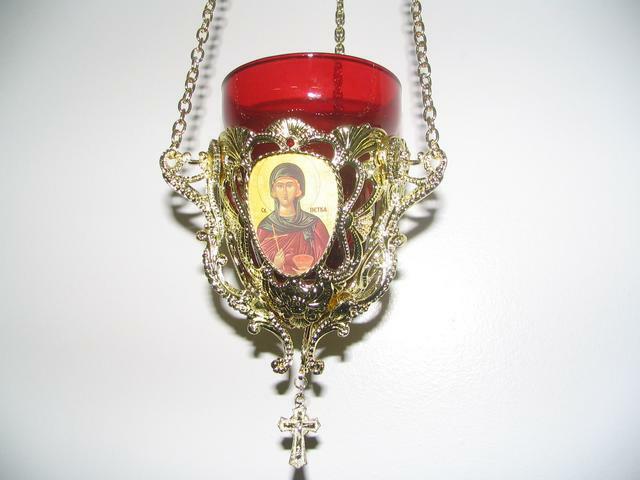 Available with the icons of the Lord jesus Christ, Most Holy Mother of God, St. George, St. Nicholas, St. John the Baptist and St. Archangel Michael. 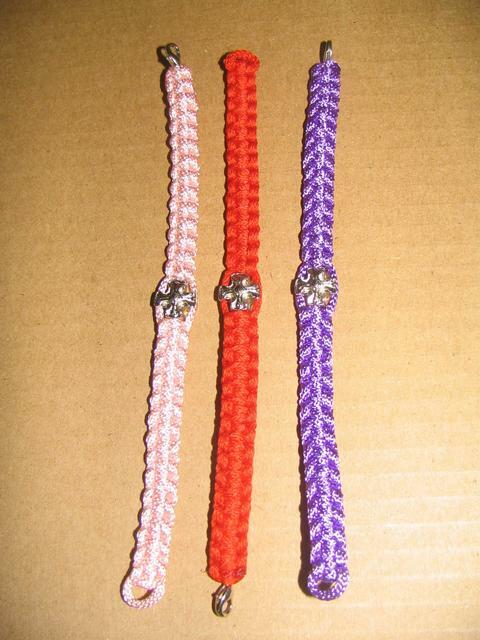 Prayer ropes: We offer a special (40%) discount on orders of 100 or more. Discounted price is $4.80 each. 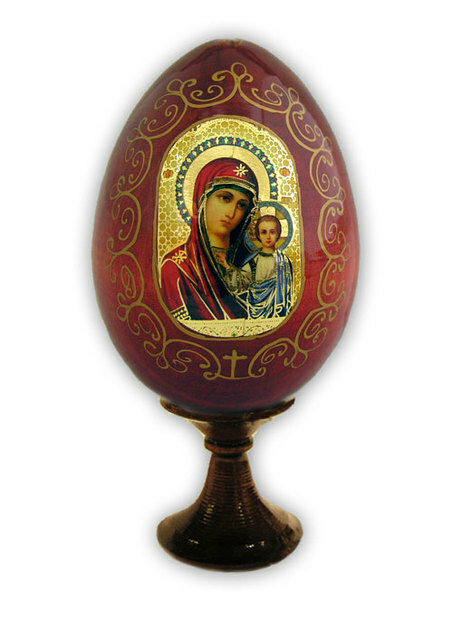 Icon meddallions made in two sizes. 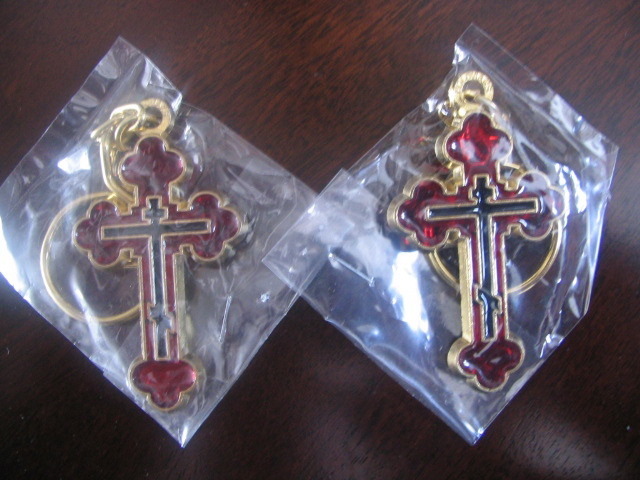 Each comes with silver chain and is packed in a nice velvet box, or a pouch. Bigger medallions come in a box with 22 inches chain and small ones in pouches with 20 inches chains. 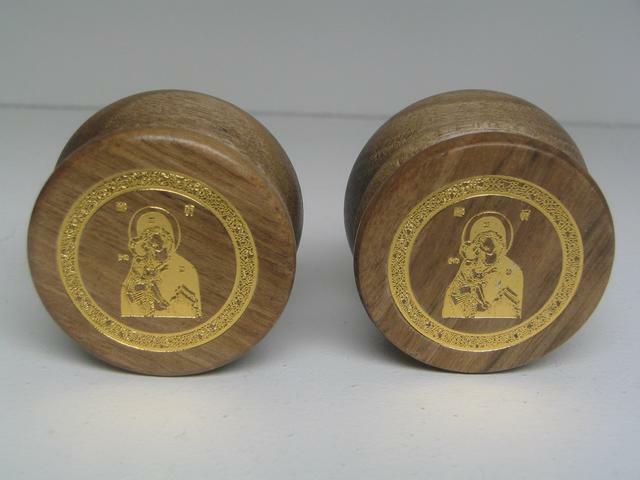 Currently available medallions of the Most Holy Mother of God, St. Sava, St. John Maximovitch and St. Seraphim of Sarov. Last one is available only in bigger size. 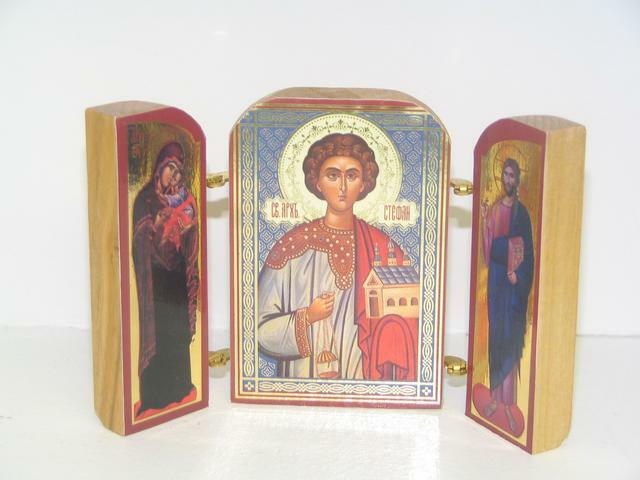 ICON WOOD SHRINES Size: 3-1/2 x 2-3/4 Price: $6.00 ea. 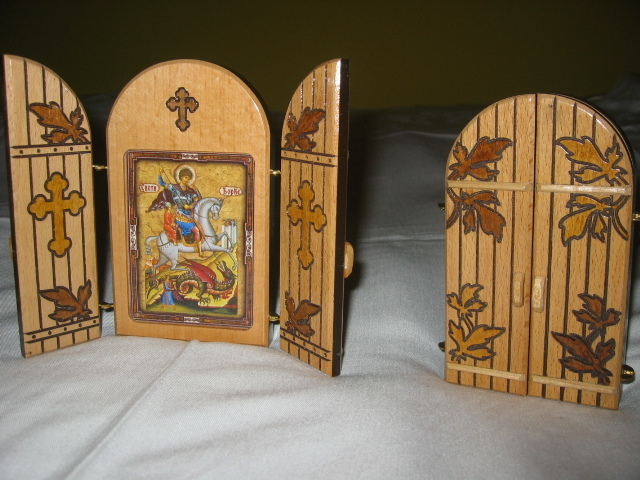 TALL ICON WOOD SHRINES Size: 4-3/4 x 2-3/4 Price: $6.50 ea. 2. 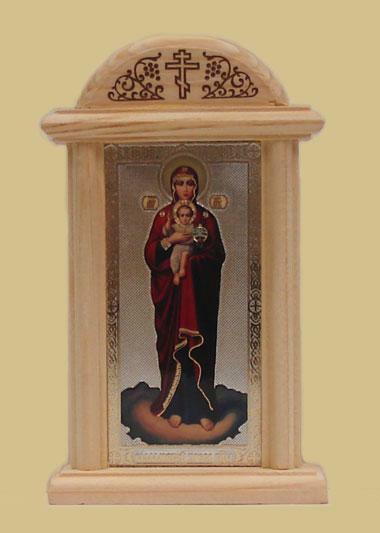 Large triptych with Lord's prayer on one side and a prayer to the Most Holy Mother of God on the other. Aside of the main icon in the middle, it also features 7 smaller icons. 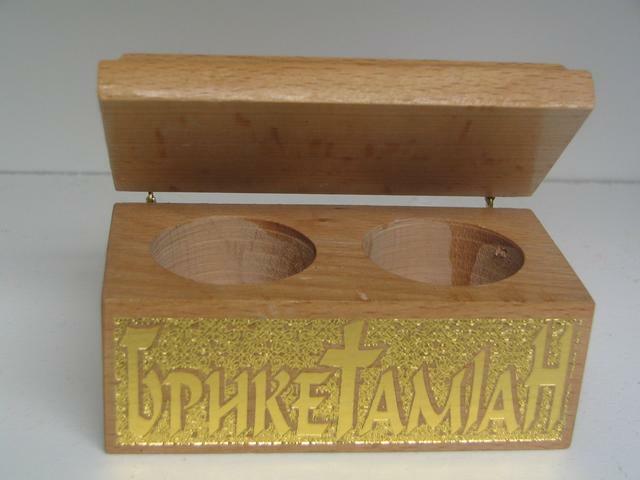 Dimensions: height: 6 1/4; width: 8 5/8 (open) and 4 inches (closed). Price: $22.00. 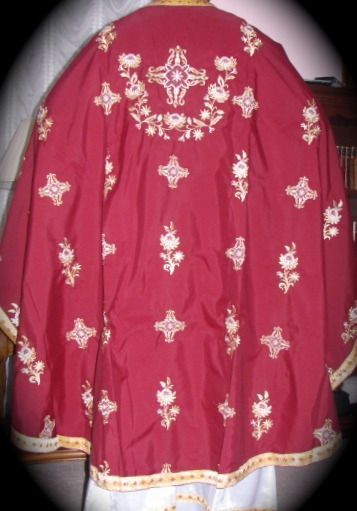 Size: style 1 (blue and burgundy) - 2,2 x 1 3/4 inches closed (3 7/8 open). This style have icons both inside and the outside. style 2 - 2 7/8 x 2 inches closed (4 7/8 - open). This style has a cross and ИС ХС НИ КА engraved on the front side. 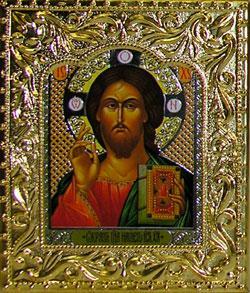 Icons on pressed wood with copper over the top. 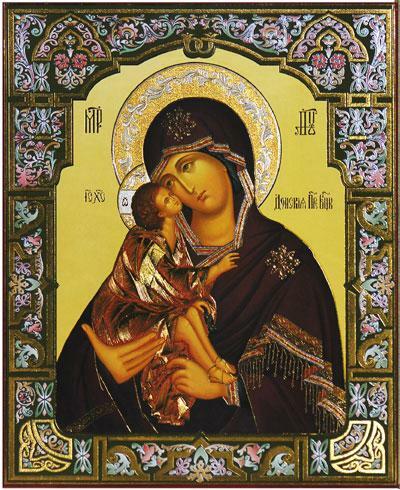 Available icons iclude: Lord Jesus Christ, The Most Holy Mother of God, St. Nicholas and St. Petka. 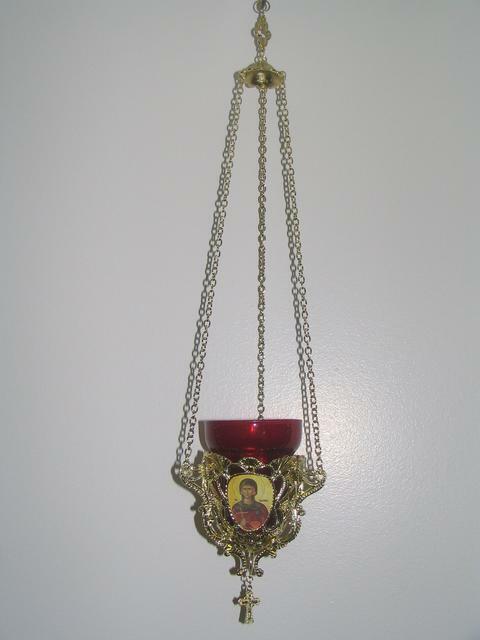 Framed icons of the Saints with gold plated nimbus and some other details. 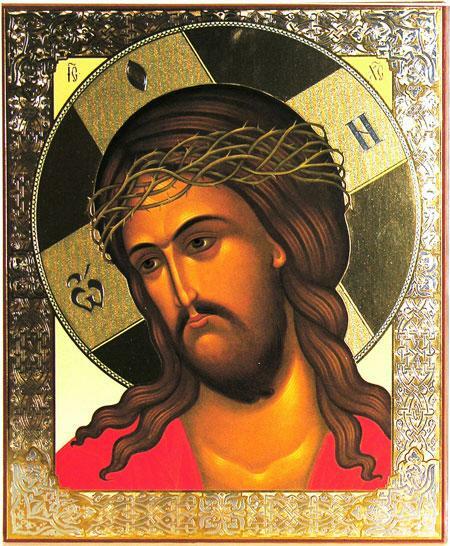 In addition to previous category of the icons theese have 4 decorative crowns in each corner of the frame. Price: $65.00 or $110.00 for both. 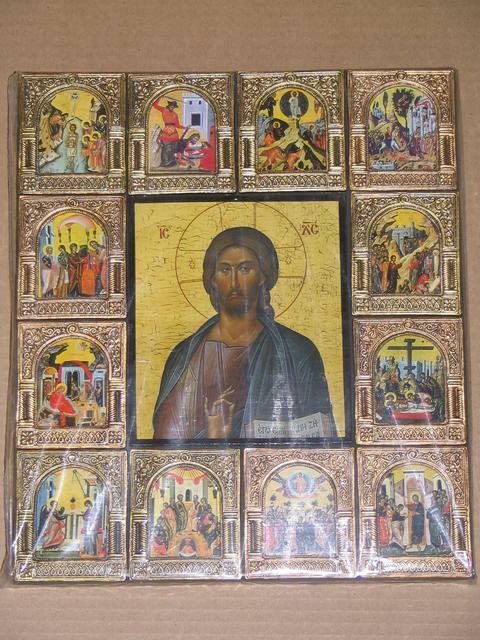 Icons of the Saints on the wood. 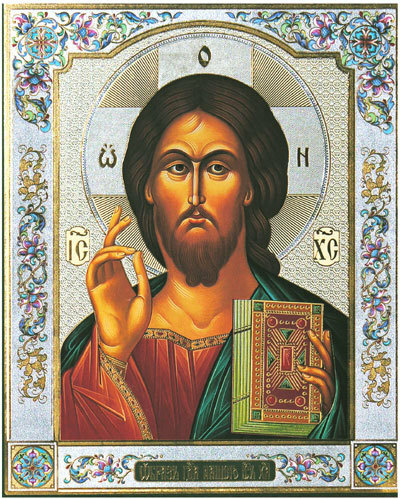 All in Byzantine style. Prices ranging from $30.00 for the large ones (8x10) to $70.00 for DS - XXL (12x18). 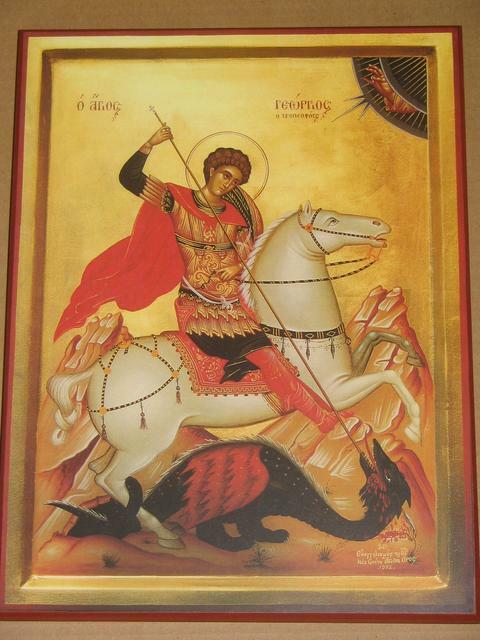 St. Nicholas and a different style of St. George's icon are available in Triple size too. 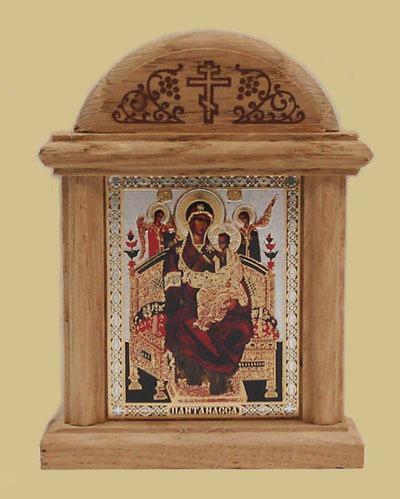 Icon of the Saint Panteleimon in Byzantine style, mounted on wood. 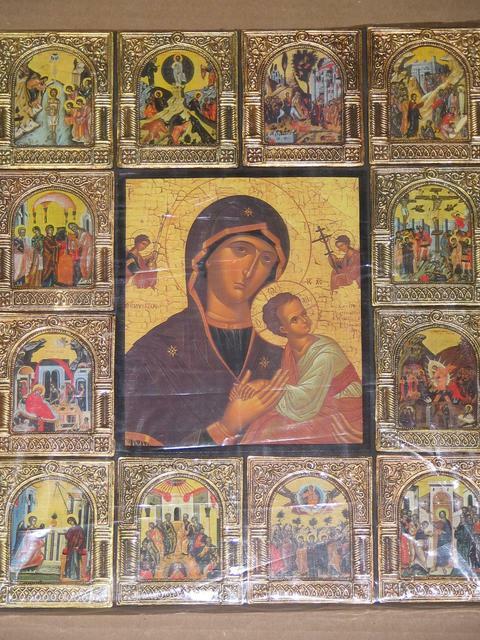 Icons on wood, Byzantine style. XXL - 12 x 18 inches; T - 16 x 20 in. ; Q - 24 x 36 in. 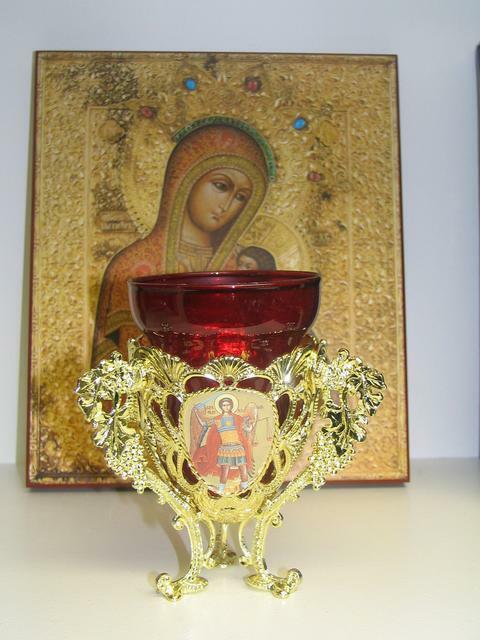 Beautiful gift at the occasion of Holy Matrimony and the Baptism. Available in two sizes. 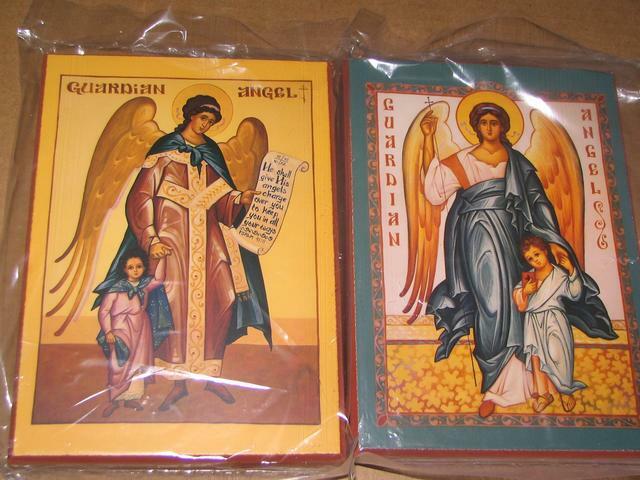 Available icons: Lord Jesus Christ, The Most Holy Mother of God, St. Archdeacon Stephen, St. George - Djurdjic, St. Apostle Luke and Holy Archangel Michael. Aproximate size 13x10. Chain length - 38 inches. 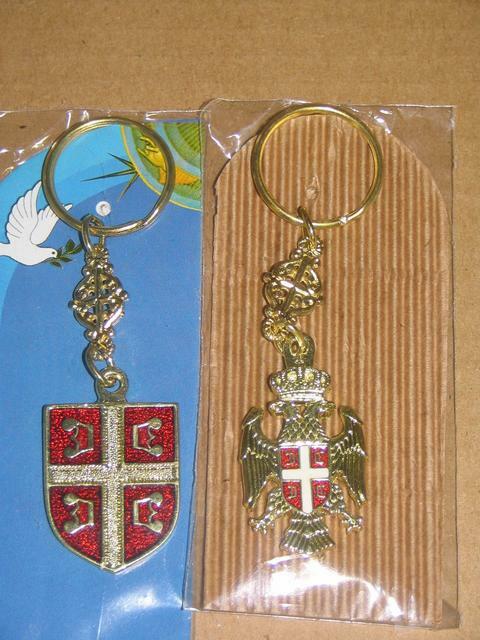 Two styles: gold one - two-headed eagle with the crown and red one with the cross and 4C-s that stand for "Samo Sloga Srbina Spasava - Only Unity Saves the Serbs"
Available in blue or red color. Size: 5 x 3 ft. The amazing true childhood story of basketball's greatest showman, Pete Maravich. 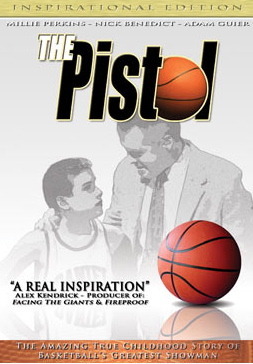 Bonus materials include: Pete's personal story, Pistol Pete trivia, Pete's records galery, English and Spanish soundtrack and other details. This is a collection of eight documentaries on suffering of the Serbian people in Kosovo and Metohija. 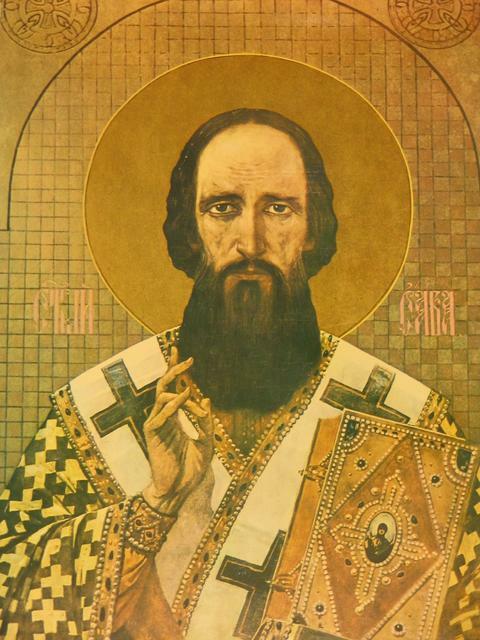 Choral Masterworks from Russia.The Choral music of the Russian Orthodox Church is designed to set the soil soaring beyond earthly cares. 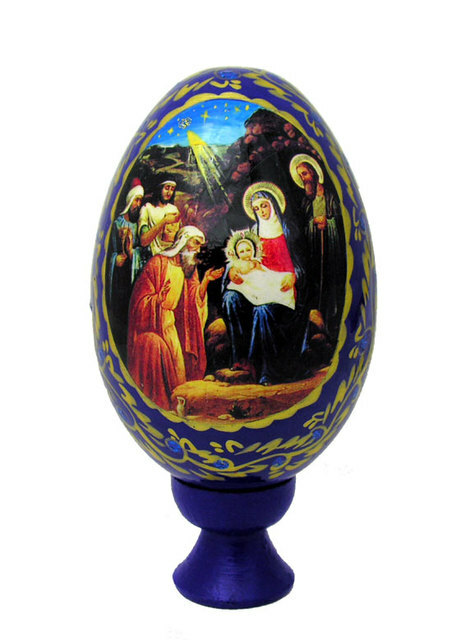 Sung by the finest Russian and Bulgarian choirs, this extraordinary collection embraces a timeless tradition of faith and devotion. Includes selctions from: Rachmaninov, Bortniansky, Kedrov Sr., Gretchaninov, Tchaikovsky, Christov, Turchaninov and Lvovsky. 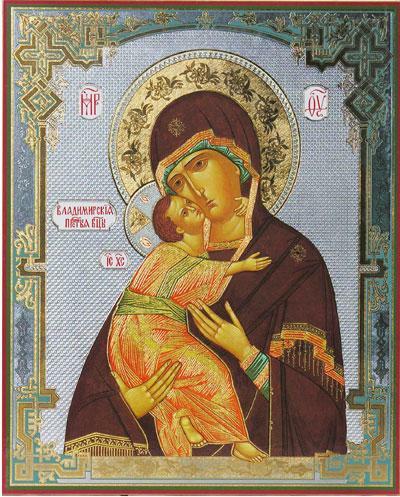 Selected prayers and songs chanted by the nuns of St. Paisius Serbian Orthodox Monastery in Safford, Arizona. Twelve most popular songs sung by the nuns of St. Paisius Serbian Orthodox Monastery in Safford, Arizona. Најпознатије великопосне химне у извођењу Драгана Учура, професора црквеног појања у Богословији Св. 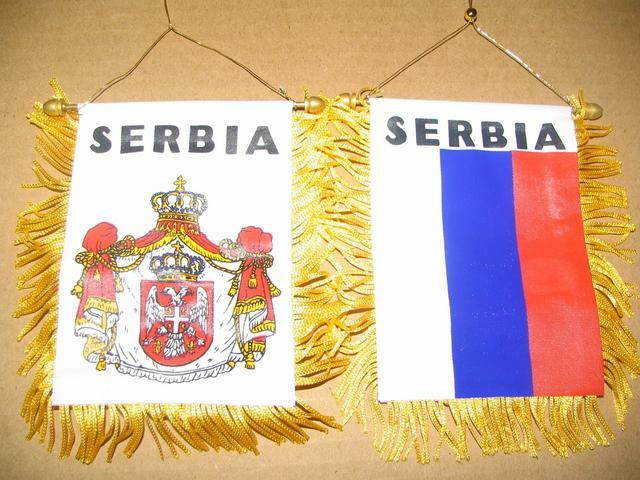 Петра Дабробосанског у Србињу (Република Српска). folding greeting cards (envelopes included) - Price: $2.00 ea. Last one is available only as a part of mixed package. LEFT - folding greeting cards (no envelopes) - Price: $1.00 ea. RIGHT - folding greeting cards (envelopes included) - Price: $2.00 ea.